On Saturday(October 13th) Natalia de Molina and Nicole Kidman attended The Academy of Motion Picture Arts and Sciences new members reception at The National Gallery in London, England. Natalia de Molina wore a SPORTMAX FALL 2018 dress which featured a black long sleeve top and a white printed panel skirt, featuring a red leather panel. Instead of wearing red sandals, she opted for PURA LOPEZ silver sandals. 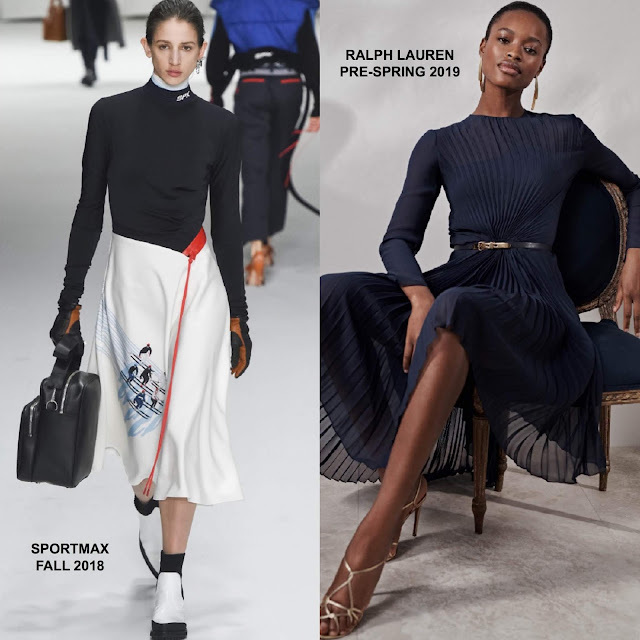 Nicole Kidaman wore a RALPH LAUREN PRE-SPRING 2019 long sleeve navy pleated chiffon, knee length dress, featuring a gathered waist. In the look book, the dress was belted at the waist. I actually prefer the look book styling especially with the belt & gold sandals. Also I can't say that I am crazy about the hair style as it comes off as aging.